June is National Dairy Month, when we are all reminded just how important dairy products are to our health (and taste buds). Back in 1937, this month-long event began as National Milk Month, as a means to promote drinking milk every day. It was initially conjured up to increase demand for milk when there was a surplus of the beverage. In recent years, however, this has become an annual tradition that celebrates the dairy industry and its global contributions. Not only are dairy products rich in nutrients, they just so happen to be delicious as well. Personally, I can’t eat a single meal without some dairy product involved… which usually ends up being cheese of some sort. So to celebrate this great month of cheese and cheese-related food products, I’ll prepare any dairy-centered dish that you, our loyal readers and fans, want. Just post a recipe below! 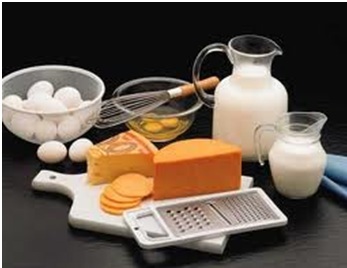 What’s your favorite dairy product? When you are in the kitchen, wearing your chef coat, what is the dairy product that you like to use the most while cooking? ← Get FREE SHIPPING on Your Next Order!